REAL ESTATE is land and all the things built or growing on it, such as buildings, fences, or crops. Real estate includes the natural resources found on the land, such as water, trees, and minerals. To purchase real estate, people often take out a loan called a mortgage. The mortgage must be paid back with interest. The Smith family just bought a new home! They will now have to pay property taxes, which support local government services. Many people own real estate, and for many people it is a source of financial security. 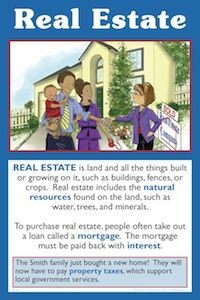 When people buy real estate, they typically put some money "down" and borrow the rest, usually in the form of a mortgage. In the past, it was common for people who were purchasing a house to put down about 20% of the house price, however, in recent years, the down payment that banks required decreased significantly, to the extent that, in some cases, no money was required for a down payment. Due to the financial crisis in 2008-09, banks now are again requiring larger down payments. One reason real estate can be risky is that people are typically highly leveraged when they buy it. That is, they put a relatively small amount of money down and borrow the rest. This can be a serious problem if the value of the house falls or if the mortgage has a variable interest rate and interest rates rise, resulting in higher monthly mortgage payments. In fact, if the house value falls enough, then the person may owe more than the house is actually worth! If a sale is then made, the loss can be significant. This happened on a large scale beginning around 2006, as house values began to fall and people had trouble making mortgage payments. So be careful when purchasing real estate. It can be a source of financial security, but also entails real risk. Go to www.bankrate.com and find current mortgage rates. Also, check rates at local banks and credit unions in your community. Make a chart of findings. Discuss the difference between fixed and variable rate loans. Bring in the real estate sections of newspapers and other real estate listings. Examine house prices and discuss what factors help determine the price of a house. Math Connection: Houses properties are often priced per square foot. Have students figure out the price per square foot of houses in your community by dividing the price of the house by the total square footage of the house. Have students create a house plan on graph paper, complete with landscaping details. Have students figure out the house’s square footage. Then have them estimate the house’s price and compute the price per square foot at www.bankrate.com and click on Calculators. Under Mortgage click How Much Home Can You Afford? (www.bankrate.com/calculators/mortgages/new-house-calculator.aspx). Discuss and estimate typical income for various kinds of jobs. Compute the expense of buying a home. Discuss the dangers of “overextending” on a mortgage.